The large and imposing Bernese Mountain Dog has become a more familiar sight in recent years. Here are eight fun facts to help you get better acquainted with this striking breed. Where does the Bernese Mountain Dog name come from? Photography by Charlotte Reeves. The Bernese Mountain Dog is one of four breeds of Sennenhund-type dogs originating in the Swiss Alps. It is believed the Sennenhund breeds developed as crosses between farm dogs from the Swiss Alps and Molosser or mastiff-type dogs the Romans brought with them when they invaded the Alps in the first century B.C. The name Sennenhund comes from the German Senne (“alpine pasture”) and Hund (“dog”), as they accompanied the alpine herders and dairymen called Senn. The quartet of breeds, in descending order of size, is comprised of the Greater Swiss Mountain Dog, the Bernese, the Appenzeller and the Entlebucher Mountain Dog. (All but the Appenzeller are currently recognized by the American Kennel Club.) The coats of all four breeds have the same distinctive, tri-color (black, white and tan) pattern but only the Bernese (or “Berner” as he is affectionately known) has long hair. He originated in the canton or region of Bern in Switzerland, hence the name. Berners were used as an all-purpose farm dog, to guard property and drive dairy cattle from the farm to the alpine pastures. Their size and stable temperament have made them popular carting dogs in this country, and with training they are happy to pull children in carts or wagons and participate in parades. The Berner is also eligible to compete in American Kennel Club Herding Events, where the breed can show off the working instincts that were so prized in Switzerland. Bernese Mountain Dogs shed year-round. Photography ©Alina Cerny | Getty Images. The Bernese Mountain Dog Club of America breed standard describes the coat as “thick, moderately long and slightly wavy or straight,” with a “bright, natural sheen.” The breed’s striking good looks have made him a popular canine model on the runway and in many TV and print ads. Berners shed year-round, with the heaviest coat blow taking place in the spring and fall. Generally, a thorough brushing once or twice a week will keep the coat tidy, maintain its sheen and cut down on the amount of hair left on furniture and floors. A bath every month or two should be sufficient, depending upon your Berner’s activity level and how much dirt he comes into contact with. Pay particular attention to the Berner’s ears as they can trap bacteria and debris if not cleaned weekly. 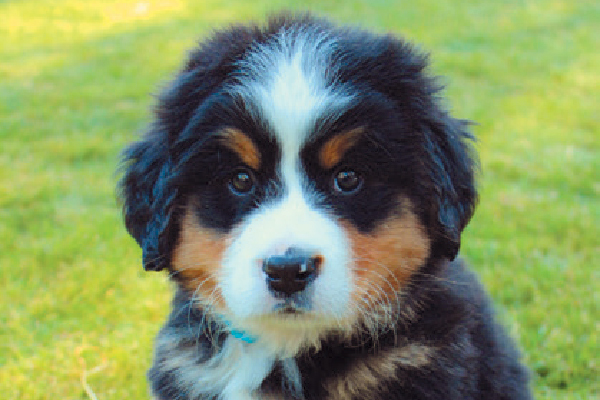 Due to its small genetic foundation, the Bernese Mountain Dog has health issues prospective owners should know about. According to North American and British surveys, nearly half of all Berners succumb to cancer. The average life span of the breed is 6 to 8 years. If you are considering adding a Berner to your household, look for a reputable breeder who can provide proof of genetic testing and is committed to producing sound, healthy dogs. The Bernese Mountain Dog is renowned as a “self-confident, alert and good-natured” dog according to the breed standard, “never sharp or shy. The Bernese Mountain Dog should stand steady though may remain aloof to the attentions of strangers.” Puppies and young adults need early and ongoing socialization. With males weighing in at 80 to 120 pounds, females at 70 to 110 pounds, this is too powerful a breed not to be friendly and reliable among people. Exposing a growing Berner to many new experiences will help develop a confident, easy-going adult. 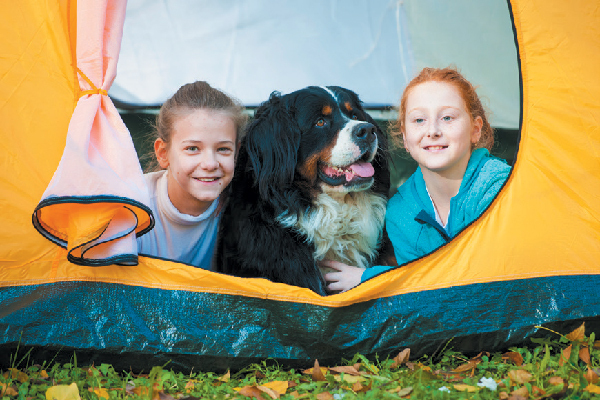 The Bernese Mountain Dog thrives on being in the great outdoors. Photography ©Stefan Cristian Cioata | Getty Images. True to his roots, this is a dog who loves the outdoors and thrives on exercise and activity. With his great endurance, he makes a wonderful hiking companion and a patient pet for children. Begin training early, and give this working dog a job to do. A Berner who has an outlet for his energy will make a pleasant house dog, while one that is isolated and not given sufficient exercise can develop undesirable behaviors such as nuisance barking, digging and chewing. With his striking, black-white-and-tan coloring, lustrous coat and impressive size, the Bernese Mountain Dog has caught the eye of many celebrities. Past and present owners of the breed include Hilary Duff, Sarah Michelle Gellar, Mark Harmon, Courtney Cox and acting couple William H. Macy and Felicity Huffman. Pittsburgh Steelers quarterback Ben Roethlisberger brought home a Berner, Hercules, from the Emmental region of Switzerland during a 2006 trip to explore his family’s roots in that country. Michael D. Higgins, the president of Ireland, owns two Berners, Brod and Shadow. Although no Berner has had a TV adventure series in the tradition of Lassie or Rin Tin Tin, the breed has captured its share of headlines for heroic feats. In 2013, Bella saved her owner, Chris Larocque, in Canada from a burning house by pulling him out to safety. In 2015, a Berner named Nico saved two people who were being swept out into the ocean by a California rip current. During the October 2017 Northern California wildfires, Izzy the Berner survived the destruction of her family’s home and emerged from the forest, tail wagging, as her loved ones frantically searched for her. 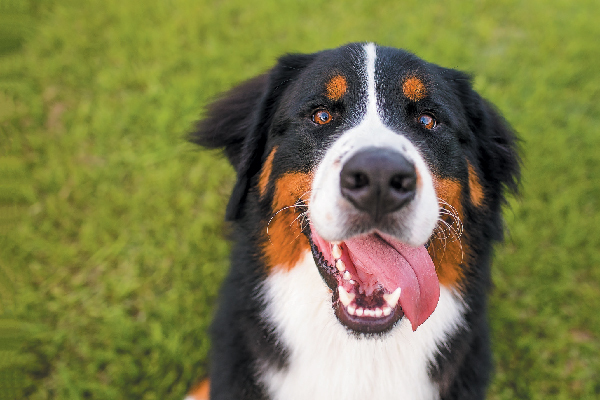 The post 8 Things to Know About the Bernese Mountain Dog appeared first on Dogster.